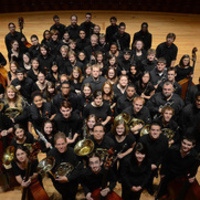 The University Symphony Orchestra is the premier orchestral ensemble at the University of Louisville, performing a great variety of orchestral literature from standard repertoire to music of the 21st century. Composed primarily of music majors (undergraduate and graduate), the USO is open by audition to any UofL student. Most notably, the USO gave its Carnegie Hall debut in 2006, was a featured ensemble at the College Orchestra Director’s National Conference in 2010 and a featured ensemble at the KMEA Conference in 2012. Active in promoting music of living composers, the USO’s most current recording, Music of Life: Orchestral Masterworks of Karel Husa, features the University Symphony Orchestra and cellist Paul York. Each year, the USO presents no less than six concerts, including the highly popular Halloween Spooktacular and the New Music Festival concert, which has included music by guest composers such as Karel Husa, John Corigliano, and Brett Dean. The USO also performs at least one concert per semester of purely orchestral works. Recent program repertoire has included Brahms Symphony No. 4 in E minor, Berlioz Symphony Fantastique, Elgar Enigma Variations, Franck Symphony in D Minor,Beethoven Eroica Symphony, and Shostakovich Symphony No. 5. In addition to its own performance schedule, the USO regularly joins the UofL Opera Theatre for a fully staged production. Recent operas include Don Giovanni, Dialogues of the Carmelites, Cosi fan tutte, The Mikado, The Tender Land, A Beggar’s Opera, Le Nozze di Figaro, Dido & Aeneas, and The Tender Land.